Executive Director Christopher Dobbs and Essex First Selectman Norman Needleman are joined by Committee Members, sponsors and participating food vendors to celebrate the upcoming RiverFare 2018. From left to right: Bill McGuiness of Becker’s Diamond’s & Fine Jewelry of Old Saybrook, Raeleen St. Pierre of Fred Astaire Dance Studio, Evan P. Barrett of The Blue Hound Cookery & Taproom, Melody Tierney, Christopher Dobbs, Joanne Deschler and Norman Needleman. 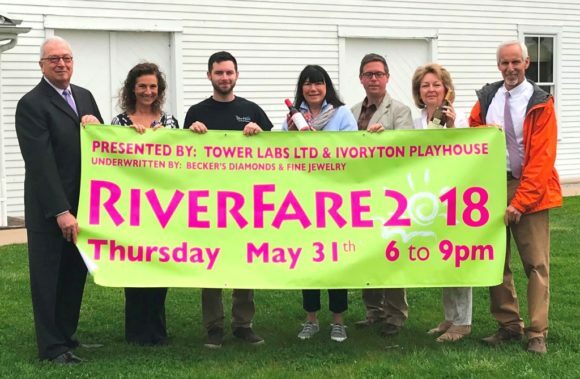 ESSEX — On Thursday, May 31, from 6 to 9 p.m., the waterfront lawn of the Connecticut River Museum will come to life again as the scenic setting for RiverFare 2018. Known as the unofficial kick-off of summer on the shoreline, RiverFare, presented by Tower Laboratories and the Ivoryton Playhouse and underwritten by Becker’s Diamonds and Fine Jewelry of Old Saybrook is the area’s most popular tasting event and will feature 25 gourmet food and drink tasting stations plus an incredible silent auction. This year’s lineup of Connecticut’s leading restaurants and food purveyors includes RiverFare new comers The Essex, Grano Arso and The Essex Clipper Dinner Train. Back by popular demand are Red House, Fromage Fine Foods & Coffees, Gourmet Galley Catering, Griswold Inn, Essex Coffee & Tea, Catering by Selene, The Cheese Shop of Centerbrook, Cloud Nine Catering, Coastal Cooking Company, Atria Crossroad Place and The Blue Hound Cookery & Taproom. RiverFarers will also have the opportunity to join in the fun of bidding in the silent auction which features a diverse array of fine gifts, services, and entertainment experiences. Items include two 10’ Pelican Trailblazer Kayaks, a three-night stay at Jiminy Peak, and a massage every month for a year at Privé Swiss Wellness in Westbrook, CT. Check out additional auction items at ctrivermuseum.org. Major Support for RiverFare is provided by Bogaert Construction Co., C. Sherman Johnson Co., Egidio Assante Wealth Management, Essex Savings Bank/Essex Financial Services, and Sapia Builders Corp. Additional support is provided by Centerbrook Architects and Planners; Clark Group; Ivory Wealth Management, Middlesex Hospital, Reynolds’ Garage & Marine, Inc., blp Enterprises, Bob’s Discount Furniture; Carr, Douglas & Cline, LLC; North by Northeast Enterprises, and Stillman & Associates. In-kind support is provided by SeaSide Wine & Spirits, Rhode VanGessel Design, and Connecticut Rental Center. Media support is provided by Valley Courier. RiverFare admission is $60 per person in advance and $65 at the door. Patron tickets may be purchased for $150 and include a premium bar and a $100 tax deduction. Net proceeds will help support the Connecticut River Museum’s mission to increase public awareness and access to the heritage, culture, and natural beauty of New England’s Great River. For more information, or to make advance reservations, go to www.ctrivermuseum.org or call 860.767.8269. The Connecticut River Museum is located at 67 Main Street in Essex. Photo Caption: Executive Director Christopher Dobbs and Essex First Selectman Norman Needleman are joined by Committee Members, Sponsors and participating food vendors to celebrate the upcoming RiverFare 2018. From left to right: Bill McGuiness of Becker’s Diamond’s & Fine Jewelry of Old Saybrook, Raeleen St. Pierre of Fred Astaire Dance Studio, Evan P. Barrett of The Blue Hound Cookery & Taproom, Melody Tierney Christopher Dobbs, Joanne Deschler and Norman Needleman.